The Smiths, who graciously provided the house and the bird, are immigrants of the Swiss nature. So, Switzerlandian. Then there are the Webbers who are invited as well and are made up of one-part Canadian to one-part Czech (marvelously heavy accent and all). Also invited are Lloyd's graduate engineering students, one from Iran and one from India. The Holbs and the yours truly are bringing up the American contingent to this American holiday all on our lonely, which is quite the responsibility! Este had asked me to bring the sides, and so here I am, literally and directly representing my country, the entire thing, coast to coast, through food. Such a task! So . . . is this pumpkin? Oh, that's squash. Like pumpkin. But, squash. Would you like to try this instead? Oh. This is cheese on top? Cultural taste buds aside, I think it is safe to say my sides were a hit! Well, I liked them anyway. I kind of felt like a hero, an American hero! Where's my purple heart! Because I am a smart cookie, I made enough sides to assure us of leftovers for the rest of November and on into December, leftovers being the best part of Thanksgiving after all, and then on Saturday night I received from the Heavens a stroke of genius and decided to cook us up a baby turkey. Afterward we sat back and stared at each other, shocked by this turn of events. It turns out, I can cook! Who could have seen that coming? And then I pulled out the Christmas tree. Lovin tradition. Very happy ending, if I do say so myself! Laughing about introducing the food to everybody else! Wish you luck with thanksgiving dinner next year! 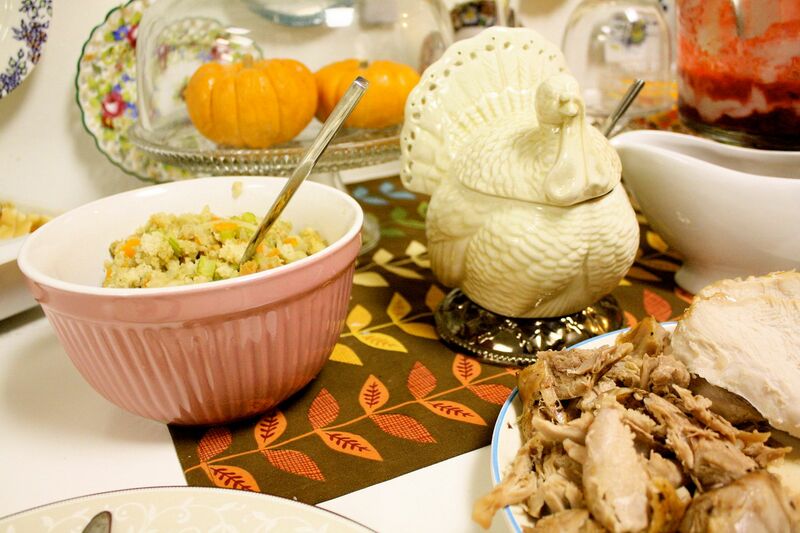 Isn't it great when you realize that you can cook a turkey dinner, and it's not that hard (just time consuming). It's another "epoch in your life," as Anne would say. We did Cornish hens this year instead, and I managed to roast them upside down. *shakes head*. They looked nice, we just had to eat them standing on our heads. hehe. I liked your choice of candy corn as a side. My kind of vegie! Seriously, your meal looks wonderful, and I know you did America proud! Oh! I love the white Christmas tree! Beautiful photos Nat! 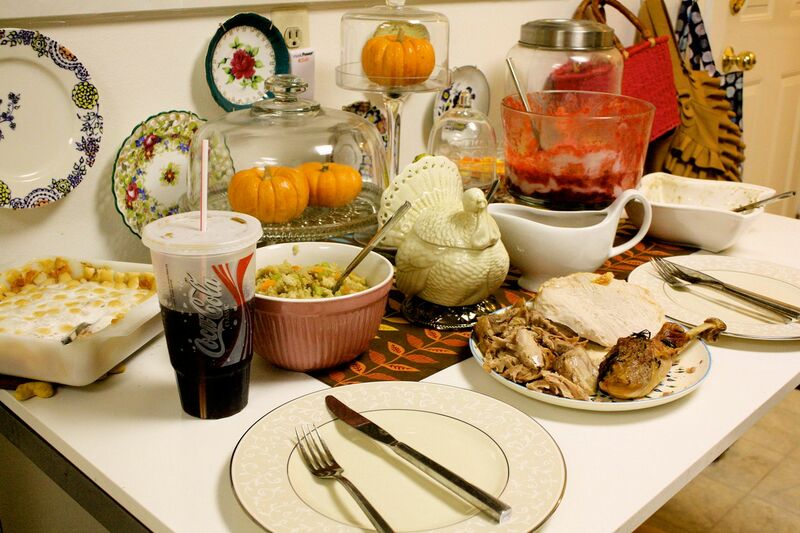 I too was amazed at how easy it actually is to cook a thanksgiving meal (this year was my first), even though my stuffing came from a box as well, why mess with what works? Loving the feathers in the tree. I too stumble into my office first thing each morning--even before going downstairs to eat! But my office is less a creative space than a place where I get all my Pharma admin accomplished. A productive bummer. (Think on THAT why dontcha?) Viva la dedicated space! 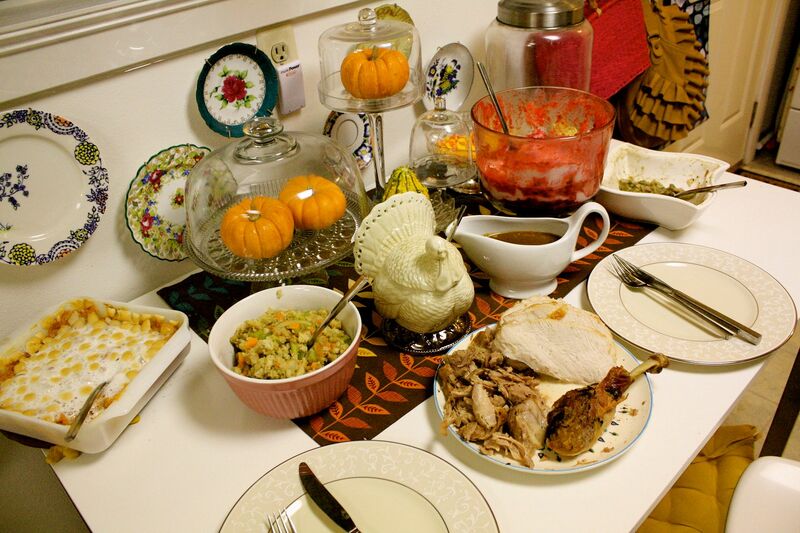 Your Thanksgiving sounded quite fun with the International Flair and then your's with the hubby...all looked so good! I am partial to the Sweet Potatoes with Marshmallows...Lovely shot of the tree...I think I will do some decorating today...Christmas music too! Delighful post! I greatly enjoy my several minutes of avoiding "work" while i read your blog. 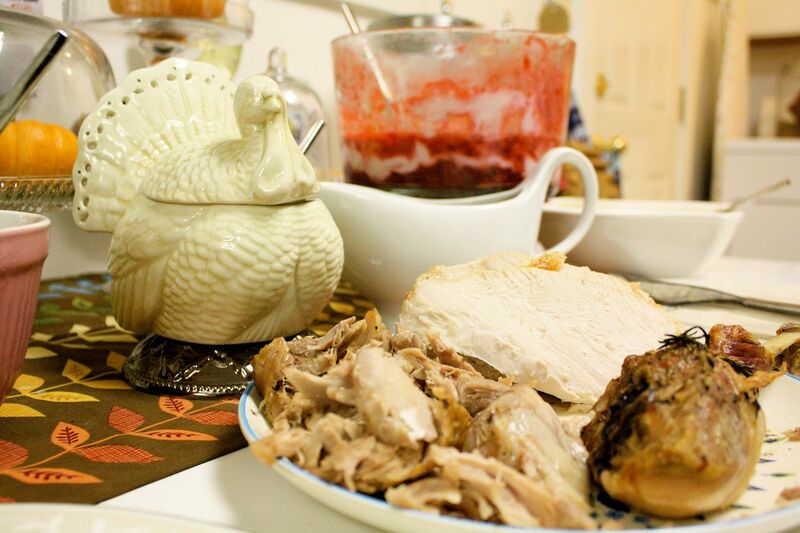 Your Post Thanksgiving Leftover Dinner looked wonderful! Can you explain to me the big pink balls hanging from your ceiling? I feel as though there should be something of the same in my house...but i need the recipe of creation! Did you make them? Did you buy them? Did you just take them from a friend house? Please share!! Allegria, thank you for that "epoch in our life," that is exactly what I was going for. Oh but Anne always knows, doesn't she? Kat, it IS a white tree! The Walmarts special! We've had it going on three years and she hasn't let me down yet. One of those fancy aluminum trees, you know. Totally cute. Believe it or not, your awesome pics are making me hungry. And I swore just yesterday that I could never possibly fit another sliver of food in my stomach. Go figure. Lovely - good post as usual. I like me some turkey. Thanks for reminding me. You always have a way of bringing taste, or smell or some sort of seemingly real feeling to your posts. Tjis time it was the flavor and the smell in the house of turkey and the whole Thanksgiving deal. Thanks Nat, I'm pleasantly full now. However, we did eat the thing with marshmallows on the top and although I'm loathe to say it...it was unexpectedly delicious! 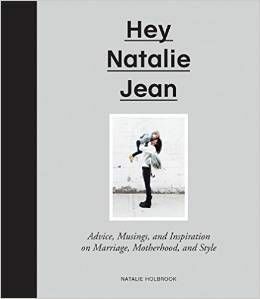 Thanks for your blog Nat, I really enjoy reading it! Amazing cooking skills! It's a lot of work, isn't it? 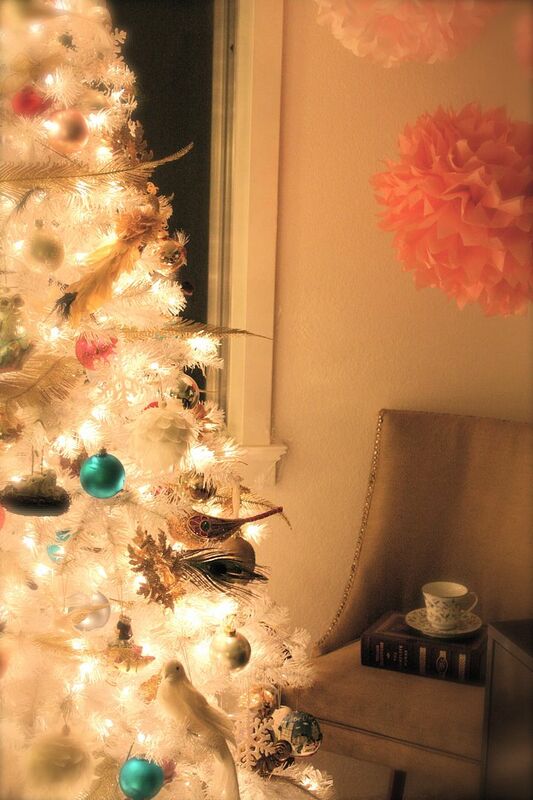 I love the Christmas tree picture with the book and tea cup in the background. Perfect! Love the idea of the cozy, take two, dinner. All the best for your whole family attempt next year! I look forward to reading about it in 2010.
oh, yams w/ marshmallows! that is what was missing from my thanksgiving table. le sigh. i'm going to have to make some this weekend now, just because. i can't believe i forgot them! thank you for sharing your table, and for reminding me! I appreciate all you guys on Nat the Fat Rat you are really doing a great job. keep it up. quite interesting we celebrate a similar feast over here in Nigeria. but it is call Harvest Thanksgiving. Wishing NAT THE FAT RAT and all her fans a wonderful and glorious X-mas.